We tackle the lineup fun, MVP, LVP and gut checks for the week. 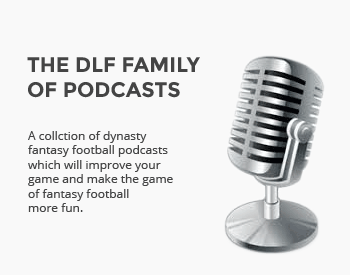 Welcome to DLF’s Dynasty Aftermath. This staple article is our longest running signature piece as we have a little fun after a tough week at the Dynasty League Football office. You’ll find this article will review the week’s happenings in a variety of ways and help set you up for the coming weeks as we spin around the league in the way we know best. Expect it each and every week. I’ve written this column for over a decade and I always forget how much I truly enjoy it. I love combing through the stats of the week, putting together ridiculous lineups, finding waiver wire gems, picking MVPs/LVPs and discussing things to worry about. I also really love sharing little bits of my life with the community of DLF and picking a theme for this column each week. This year, I’m going off the rails a bit. I’m not just exclusively choosing movies or TV shows and sticking with them. I’m simply picking something relevant, wacky or whatever may come into my mind each given week. My hope is each week will at least be interesting in some way and hopefully make you laugh a few times along the way. As we saluted our veterans this weekend, things kind of hit me. We talk about our great servicemen and women a couple of days each year, then carry on with our daily lives. Every day should have an element of respect for the lives lost and time so many have given to protect our freedom. This week, there are no stories or jokes. I think of my Grandfather who served in World War II and still refuses to talk about it. I think of people like Pat Tillman who risked everything for a higher cause. I think of so many who don’t get thanked enough and simply say…thank you. The tight end position has been a little disappointing this year but those lucky dynasty owners who have Zach Ertz or Travis Kelce have had a huge competitive advantage. Ertz was amazing this week with 14 catches for 145 yards and two touchdowns. The point differential between Ertz and the second tier tight ends this year is getting close to ten points per week, which is enormous. Speaking of tight ends, OJ Howard has been great nearly all season. Unfortunately, this was not his week as he had just one catch for 15 yards. If you had Howard in your lineup and were playing against Ertz, you likely had around 40 points to make up in other spots and that likely proved pretty difficult. Would have qualified, though I don’t think his performance was really that shocking. I wanted to make the Gado reference below, so I put him in the gut checks. I think most have seen the breakout coming. My question is now all about utilization. I have a hard time thinking he can be a true RB1 with 15 carries per game. Yeah I don’t trust McCarthy enough to think he will get the volume he probably deserves. Thanks for the Veterans Day shout out. I appreciate it. I was proud to serve my country, especially after 9/11. Cheers.